I love you NYC, but I absolutely hate having to move apartments in the city. I am sure moving ANYWHERE is rough, but in NYC it is especially difficult. First of all, imagine moving WITHOUT a car. Plus everything here is super pricey. After moving in and out of four apartments over the past four years, I would consider myself a pro. From renting a UHAUL to ubering everything myself, I have tried moving in the most resourceful ways. As Justin and I were tallying out the costs of moving we really thought we could do it on our own, without calling in the help of a moving company. But as our move in date got closer and closer, my stress levels kept rising and rising. After my double mastectomy, I am not able to lift much more than 10 pounds and let's be real here, my shoe boxes weigh at least 30 pounds each! Justin also has the back of an eighty year old man, so he wouldn't be much help either! One day on my walk home from work I happened to pass by this truck and it was a definite sign from the universe. "We won't let anything break during your move, especially you!" This really hit home for me and made me take a step back and think, WHY ARE WE STRESSING WHEN THERE IS THIS AMAZING MOVING COMPANY HERE TO HELP?! I looked up Roadway and I was blown away by their reviews. So when I reached out to them and told them about The Breasties they were so eager to help us out! After packing up all of our stuff, Justin and I were able to sit back and relax while we let the pros work their magic! Within a few hours, all of our stuff was loaded out of our old apartment, packed into the truck, and unloaded into our new home! Less time moving = more time for Champagne! Bottom line, if you can avoid stressing and let someone else handle the heavy lifting, I definitely recommend it!! PS. 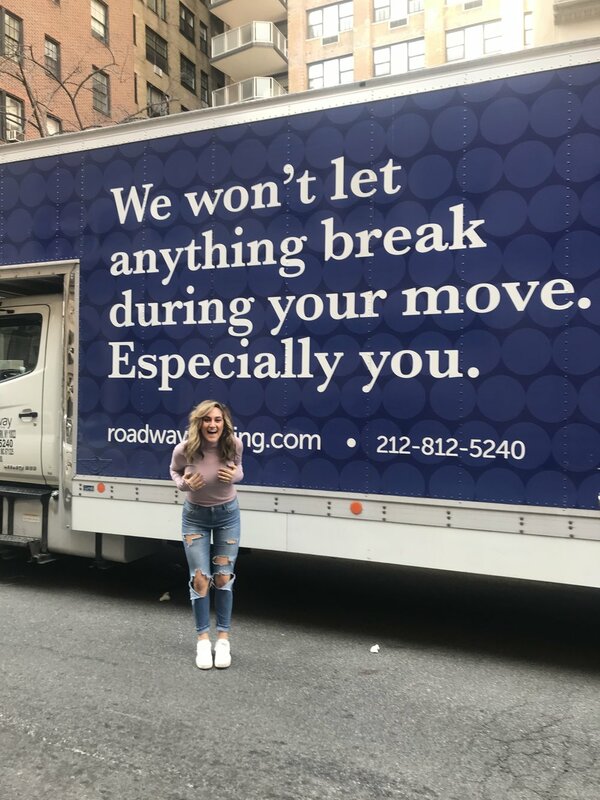 If you are planning a move, definitely check out Roadway Moving and you can use code: PAIGE for a discount on your move!! Thank you so much Roadway Moving for playing a huge role in turning our new apartment into a home. We love you! !